The seed for the idea for this series arose over a year ago when I sent An an invitation with this button attached asking if she would like to take my part in my first series - When we were young. An said she would love to take part... and where did I find that picture? I told An it was an illustration from one of my favourite childhood books - Debbie's birthday party (which also inspired my first pattern). An as it turned out was about to release her second dress pattern - Tinny, which was also inspired by Marlier's illustrations and one of the main characters he illustrates - Tiny! And so began a conversation about the illustrator, Belgian born, Marcel Marlier (pictured below with one of his characters and sweet puppy). An and I both love Marlier's illustrations and although I only have a few of his books, I have found myself flicking through pinterest for sewing inspiration from his beautiful drawings. Marcel Marlier was born in Belgium in 1930. He entered a drawing competition in his young teens, which he won. 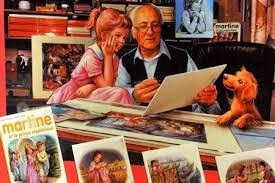 This propelled his super productive career as one of the world's most famous and recognisable children's books illustrators. 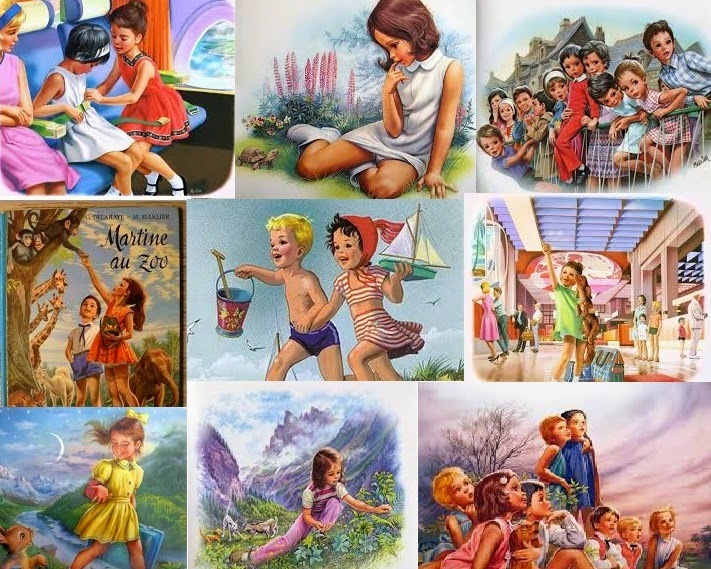 He illustrated works written by Gijs Haag and Gilbert Delahaye for decades. The books Marlier illustrated were translated into over 20 languages and are still sold around the world. The names of the characters were changed to suit the country of translation, so you may be familiar with Debbie, Tiny, Anita, Martine, depending on where you live in the world. Marcel Marlier died in 2011 at the age of 81. So to pay tribute to this extremely talented artist who has given us much inspiration, we are very excited to have bloggers from all over the world who will be sharing what they have sewn inspired by Marcel Marlier. We can't wait! In addition, we are also organising a huge give-away. Two generous sponsors provided us with $300 dollar in prizes! There will be six winners, with one of them winner no less than $150 in fabric vouchers. 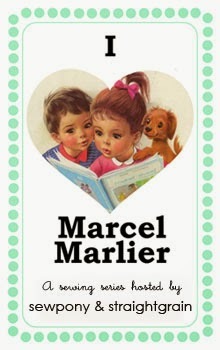 An and I are also giving way three vintage Marcel Marlier books to one lucky winner. 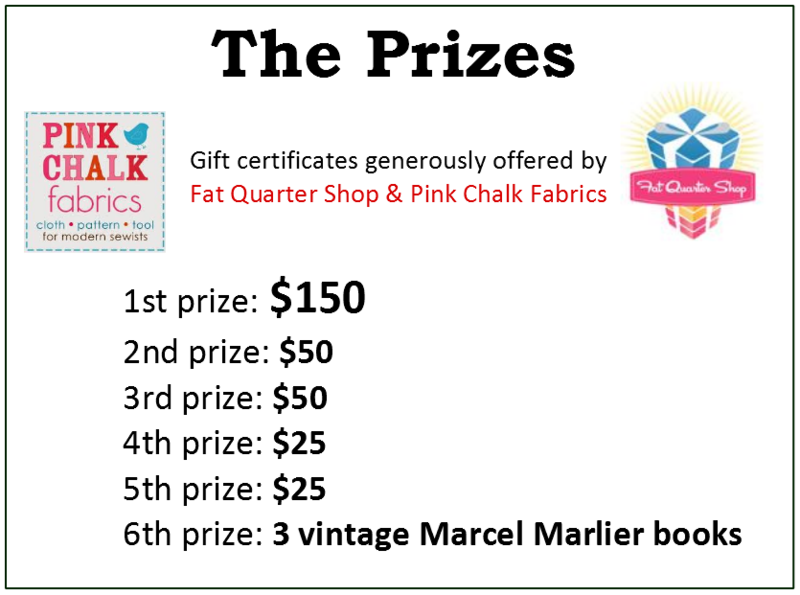 We'd like to already thank our two sponsors, Pink Chalk Fabrics and Fat Quarter Shop, for their support and generosity! Many of you will already know these fabulous shops, but we'd like to present them to you anyway. Pink Chalk Fabrics was launched in 2008 with the mission to provide the best cloth, pattern, and tools available for modern sewists. Shop owner Kathy Mack's motto is Do What You Like, Like What You Do. Pink Chalk Fabrics sells fabrics from some of the top designer brands (e.g. Michael Miller, Cotton + Steel, Alexander Henry, Cloud 9, Echino, Moda, Riley Blake, Liberty of London) as well as patterns (e.g., Oliver + s, Amy Butler, April Rhodes, Sew Caroline) and tools. If you like Marcel Marlier style clothes, you will surely appreciate their extensive range of designer solids (e.g., Cotton Couture Solids, Kona, Moda Bella, Robert Kaufman Essex Linen). Pink Chalk Fabrics ships internationally. The Fat Quarter Shop was founded in 2003 by Kimberly Jolly. An avid quilter, Kimberly began her shop as a side business while still working a corporate position, but as The Fat Quarter Shop grew, she decided to make it a full-time operation. Kimberly's shop offers fabrics from top brands such as Cotton + Steel, Dear Stella, Bernatex, Cloud 9, Art Gallery, Free Spirit, and many more. But you can also find a great range of books and patterns (e.g., Indigo Junction, V and Co, Blackbird Designs) and threads and notions in their shop. The Fat Quarter Shop too sells a great collection of designer solids (e.g., Cotton Couture Solids, American Made Brand, Moda Bella, Kona). The Fat Quarter Shop ships internationally. 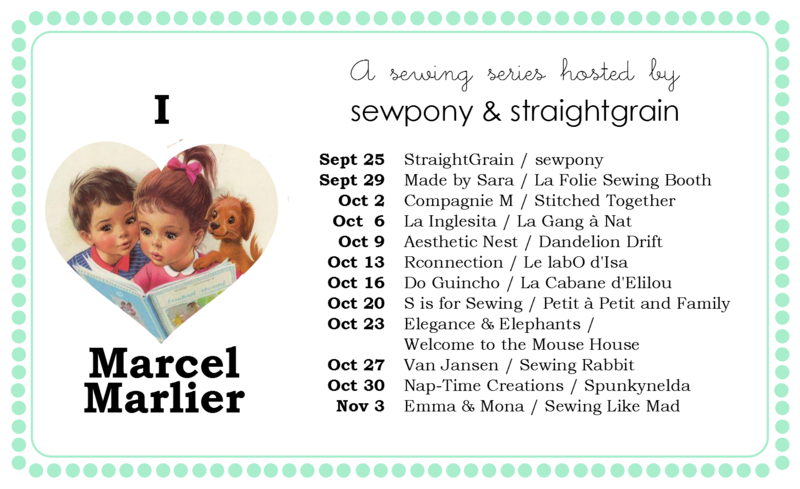 We hope you are excited about this series and that you are ready for some sweet vintage sewing!! See you tonight! Glad you are excited girls!! By the way, I love the button! Gorgeous! I'm so excited for this series!! Getting close to starting my project! 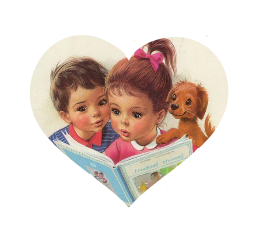 Tiny (or Anita for me) books are such a fond memory of my childhood. This will be such a sweet series to be in. Thank you!